DEFEND YOUR CUSTODY RIGHTS WHEN YOUR EX INTERFERES! This publication totals more than 500 pages-broken into eleven sections. Each section can be viewed and printed separately anytime that you want. We have made it easy for you to return to the Content Site over and over again for as long as you want. ~~~Maybe you want to print a section or two for you or your lawyer---no problem! “The site is yours to use 24 hours a day, 365 days a year!" (1) ADULTERY, (2) EXTRA-MARITAL SEXUAL MIS-CONDUCT, (3) "FRIENDLY PARENT DOCTRINE," (4) CAREGIVING PARENT, (5) RELIGION, (6) JUDICIAL BIAS, (7) "PSYCHOLOGICAL PARENT DOCTRINE," (8) MOTHERS Vs. FATHERS BIAS, (9) MANY MORE The importance of each in current custody and visitation decisions. Courts have the power to modify child custody arrangements to meet the needs of the child and to respond to changes in the parents' lives. A parent seeking to change custody through the court usually must show that the conditions have changed substantially since the last custody order. This report discusses in detail everything that you need to know if you or your former spouse seeks to modify a custody order because of a "change in circumstances." PARENTAL ALIENATION SYNDROME (PAS) WHAT IS PAS? HOW CAN YOU COMBAT IT? HOW DO YOU HANDLE IT IN COURT? EXPERTS PRESENT THE MOST COMPLETE VOLUME OF INFORMATION FOR PARENTS ABOUT PARENTAL ALIENATION SYNDROME. PAS---sometimes called Parental Alienation--- is a disorder that arises primarily in the context of child-custody disputes. The main way that it appears is the child's campaign of abuse and aggression against a parent, a campaign that has no justification. It results primarily from the programming (brainwashing) of a child by one of the parents, whose goal is the complete vilification of the other parent. 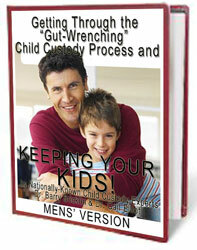 CHILD CUSTODY STATE LAWS There is a current 15 to 17 page report for each of the 50 states and DC. All State Laws concerning: (1) CUSTODY, (2) VISITATION, and (3) CHILD SUPPORT are covered. You’ll be able to download the state that you choose. Your stuff worked…I got to keep my little girl! My next door neighbor went through the same thing and pointed me to you. He won and so did I. Now, one of my new neighbors is getting involved in a real nasty custody dispute over his four year old. You’ll hear from XXXXXXXXX in Philadelphia soon. Ordering a Downloadable Book is Easy & Confidential and you’ll be reading it in just three minutes! Just click the "CLICK HERE TO ORDER THE DOWNLOAD" button at the bottom of the Publication that you want. You will be advanced to an area where you provide your billing information and then will be automatically transferred to the Download Site where the titles of your publications are listed. All you have to do is CLICK on a title, wait about 20 seconds, and that publication will open for reading and printing. You’ll be able to return to the Download Site over and over, 365 days a year. Why a Download and not a regular book? Because everything in the field of Child Custody is moving too fast—way too fast to take the 18 months to produce a book and find that EVERYTHING is outdated. With a Downloadable Publication we can make changes IMMEDIATELY (and we do)---you are always getting the most recent information available! After you purchase the Download of this Publication you’ll be offered the option of receiving a SECOND COPY on a Compact Disc. Your CD will contain EVERYTHING that you purchased including Bonus Items. This Publication contains over 900 pages and thousands and thousands of specific resources that will help you assert your Child Custody Rights while spending little or no money! Every state is represented! You’ll be able to come back to this site whenever you need to research economical ways to handle your case. 614 pages plus FULL Access to the 912 page BONUS site! You will automatically receive the most recently updated package of publications. INCLUDES the 912 page BONUS!